George H.W. 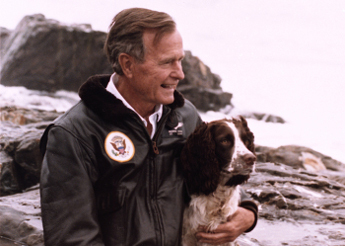 Bush was an active member in the seaside community, where well-wishers gathered Saturday to pay their respects to the 41st president. 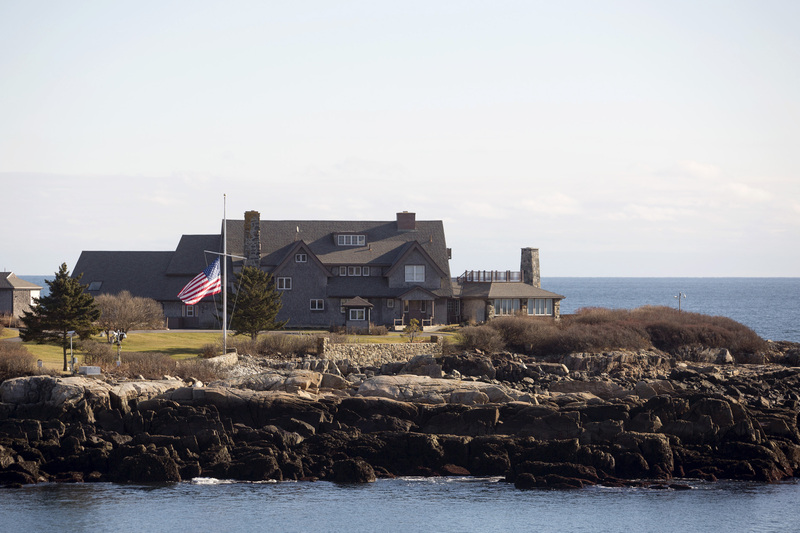 KENNEBUNKPORT — Flags were flying at half-staff across town Saturday morning as TV crews filled the parking area on Ocean Avenue overlooking the Bush family compound at Walker’s Point. Down the street visitors started to arrive at St. Ann’s Episcopal Church, where George and Barbara Bush worshiped, to pay their respects. The church is not normally open this time of year, but sexton Reggie Sargent said knowing that people showed up when Mrs. Bush died earlier this year he was prepared to open the doors to the unheated church. “I thought we should do the same for George,” Sargent said. The picturesque seaside town was already filled with tourists and visitors for the annual 11-day Christmas Prelude celebration. While downtown streets were clogged with throngs of shoppers, the small stone church and its waterfront grounds offered a quiet place to remember the 41st president. Townspeople said that it was appropriate that the former president’s death coincided with the townwide holiday festival. 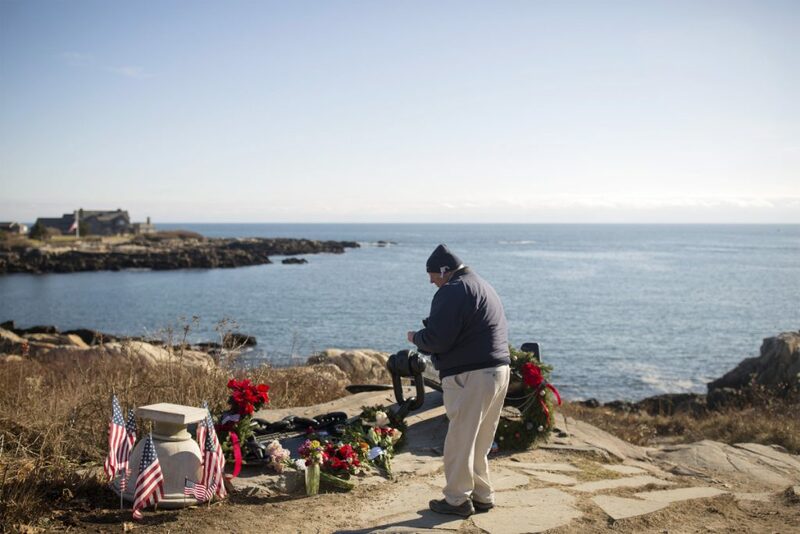 “They all feel the same, a sense sorrow at his passing and a sense of celebration of the life he had led here,” said Tom Bradbury, head of the Kennebunkport Conservation Trust. 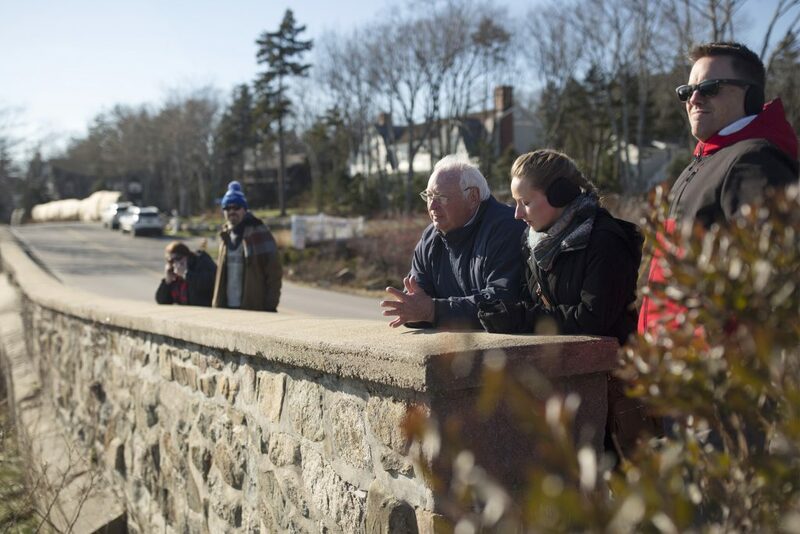 Back in the 1990s, when the trust was first starting out and was all volunteer, Bradbury recalled, a little island essential to the character of Kennebunkport harbor went up for sale. Bradbury said the only way he could think of raising the $60,000 down payment in two weeks in order to secure the island was to make an appeal through the Portland Press Herald, which ran a story. Bradbury told the paper they needed just 12 people to come forward with $5,000 each. By 7:30 a.m. the day the story broke, President Bush was on the phone pledging his support. Bradbury said the president went on to become a major benefactor of the trust. A steady flow of walkers and motorists had entered the St. Ann’s grounds by midmorning Saturday. “He was an amazing president, and beyond all that it is the values he instilled, which is as important a legacy as his presidential one,” said Andrea Long, who walked into the open doors of the church sanctuary carrying her small dog, Oreo. 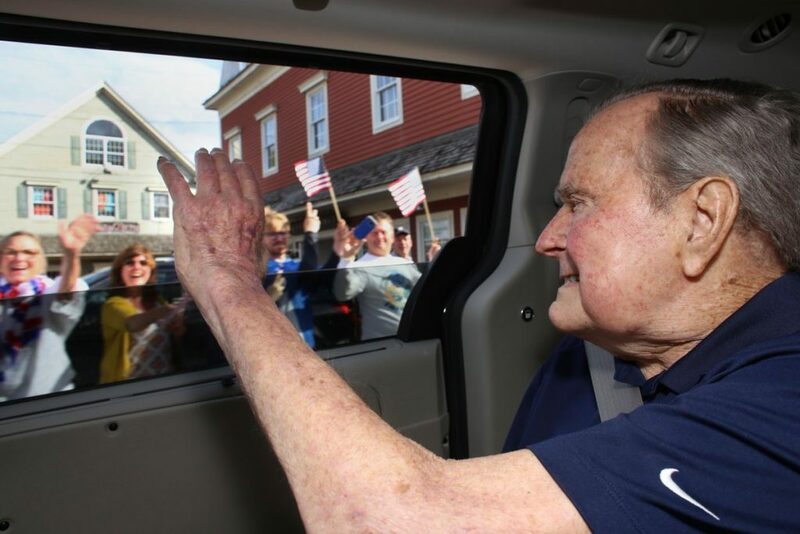 Long was visiting her parents, who live in Kennebunkport. She said they all talked about the Bushes during a caroling event Friday night that was part of the town celebration, “and then woke up to find out President Bush was gone,” she said. Tom and Penni Hughes of Hingham, Massachusetts, stopped by the church – where their daughter is scheduled to be married in 2020 – to pay their respects. “He was really a gentleman. It’s a different time,” said Penni Hughes, a former area resident. Ann-Marie Sweeney of Kennebunkport led a group of out-of town friends into the church, where she attends services in the summer. “It was so sad when we saw the news and to remember the impact the Bushes had on the community here,”she said. Sweeney said it will be interesting to see what will happen now that the senior Bushes, who shopped, dined and blended in with their neighbors, are gone. A short way along Ocean Avenue others gathered at Parsons Way, a trail with a pull-off parking area that offers views of the Bush compound on Walker’s Point. 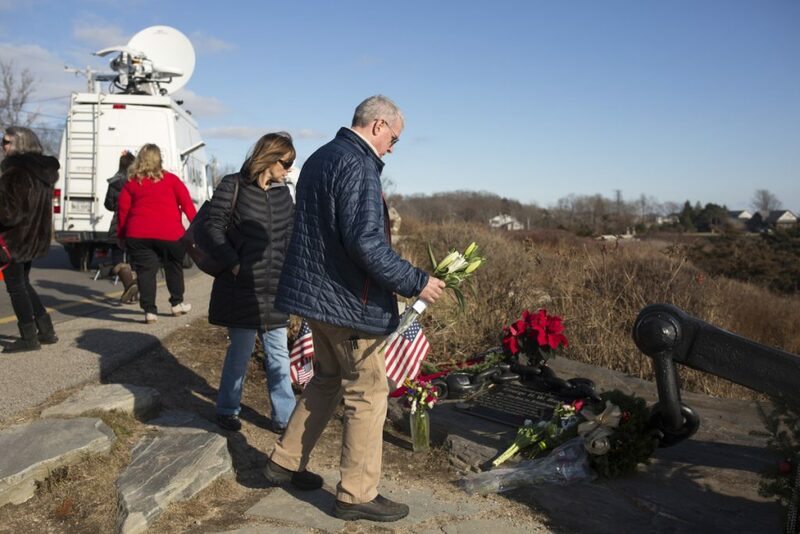 Visitors left flowers and mementos at the trailside memorial, a 6,000-pound naval destroyer anchor, erected by the town in Bush’s honor in 2009. Jeff Mangarpan of Exeter, New Hampshire, made the trip to Maine after an earlier appointment in Boston. 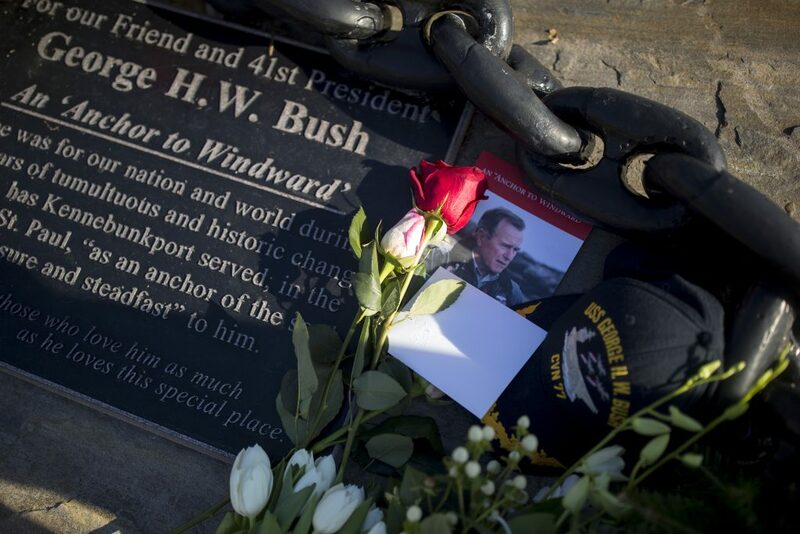 He placed a clutch of lilies and a card at the anchor memorial. “He was the last of the Greatest Generation. He had a lot of class and he was really humble,” said Mangarpan. Others remembered their own encounters with the Bushes around town. 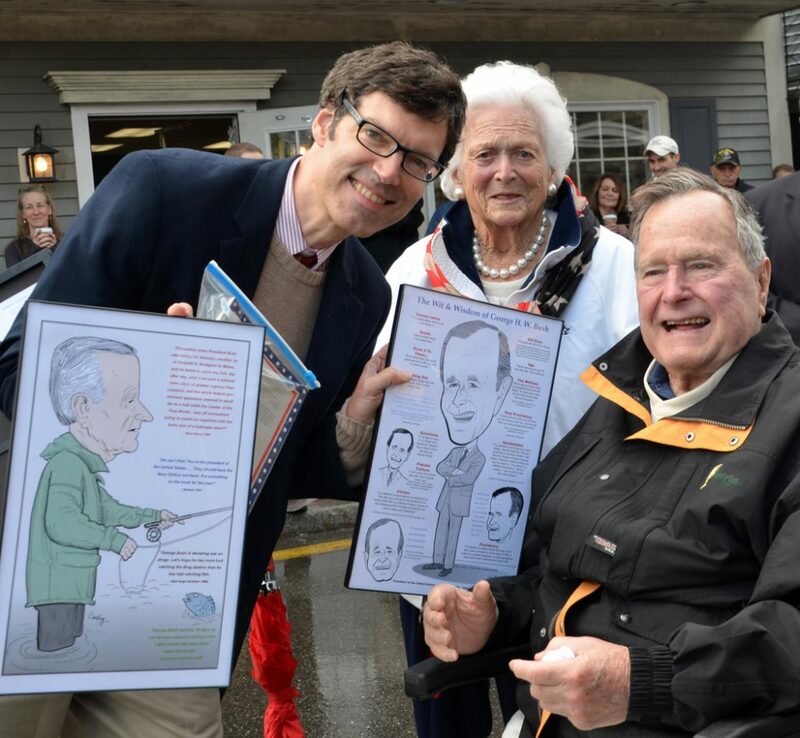 Robert Carley of Darien, Connecticut, has a photograph of himself and the senior Bushes taken during the 2014 Kennebunkport Memorial Day Parade when Carley presented the president with several caricatures he had drawn. The president wrote back to thank him several months later. “It has just come to my attention that I never wrote to thank you for the caricatures you gave me at the Memorial Day parade. I apologize, and I want you to know that my lack of proper etiquette here should not be construed as disinterest or displeasure. Fact is, I love the caricatures and have posted them here at Walker’s Point for all to enjoy. They’re getting rave reviews!” the president wrote.